Carry America's NEW #1 Top Rated Paracord Chainsaw In Your Pocket! ✔ Add rope to handles to make a high limb cutting saw! ✔ Nicely Packaged → Poly Bag! ✔ Makes A Great Gift For Any Outdoor Enthusiast! ✔️NEW FOR 2018! 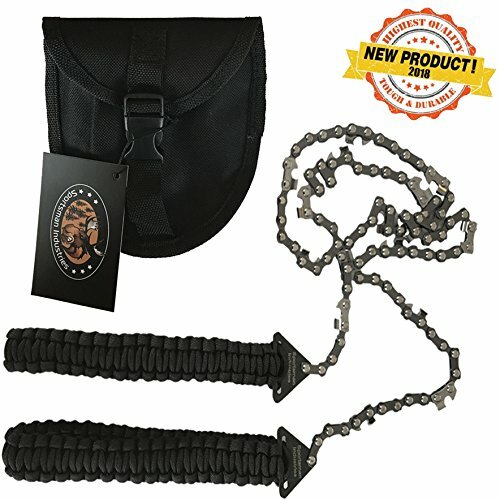 - Our #1 best selling Pocket Chain Saw now has MILITARY GRADE PARACORD handles for extra strength and durability. Tested for 550 lbs - made of seven inner strands a.k.a. fire tinder, fishing line or sewing string. Use it when camping, fishing, hiking gear, hunting gear and outdooring. ✔️IN A SURVIVAL SITUATION? - Simply untie the paracord handles and use it to secure a tent of make a survival shelter. Use it for traps or snares or make a tourniquet. Use it to make a bow drill for fire starting or use the inner strands for fishing line. Perfect for any bush crafting. ✔️LENGTH MATTERS! - While other 24 inch saws are too short, too weak, or simply just break after a few uses, our saw has a full longer, thicker 36" chain (EXCLUDING HANDLES). The bi directional, self cleaning chainsaw style cutting teeth tears through wood cutting both ways! Made of high 65 mn high carbon heat treated steel, the longer chain equals incredibly fast cutting time with razor sharp blades sawing 3 sides of a limb at once clearly outclassing the competition in quality & performance.